The Grand Canyon is filled with hiking options for any level of experience. There are however a select few who dedicate their lives to traversing it. 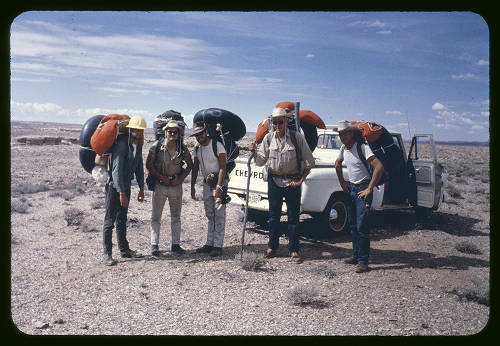 These individuals are recognized for spending their days climbing, hiking, swimming, and camping in the farthest reaches of the Grand Canyon. Harvey Butchart, an NAU Mathematics professor, is known for having hiked the entire length of the canyon. He has meticulously logged most of his travels, totaling more than 1000 pages. These pages cover 12,000 miles, 1024 days, 83 summits, 108 paths to the river, 164 wall climbs, and 25 first ascents. His logs were compiled in a single book titled Grand Canyon Treks: 12,000 Miles Through the Grand Canyon (earlier releases split this book into three editions). Though he began hiking the main trails of the canyon, he quickly branched out to abandoned, prehistoric, and animal trails. He was also involved with NAU's (then ASC's) hiking club and served as their sponsor for 12 years. Butchart hiked with groups most of the time in the beginning and slowly began to hike more on his own. Despite the sheer amount of hikes, Butchart never sustained more than a few broken bones throughout the course of all his hikes. Today he is a bit of a canyon legend - his maps, notes, and memory continue to serve those that wish to explore the Grand Canyon as he did. George Billingsley is another prominent hiker of the canyon. 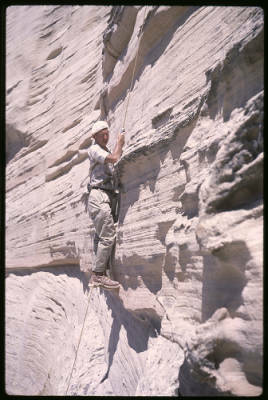 Born in England in 1945 and raised in Arizona, Billingsley has been hiking the canyon since the early 60s. During his undergraduate study at NAU, Billingsley was a part of the hiking club. 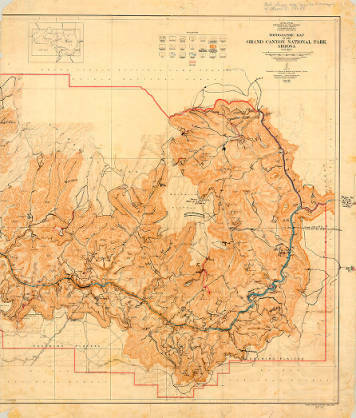 He graduated in 1971 with a degree in Geology and did work after mapping for USGS, mapping the entire lower Grand Canyon, almost exclusively on foot. He is also credited for discovering a new layer of the canyon: the Surprise Formation. After noting how thorough Butchart was in logging his hikes, Billingsley decided to do the same. Meticulous hiking logs span multiple decades, beginning in 1963. His knowledge of the canyon does not stop there. He has co-authored a book on the mines of the Grand Canyon titled Quest for the Pillar of Gold: The Mines & Miners of the Grand Canyon. Billingsley has done work as a commercial river runner and guide and as a Parks Service ranger.